When looking for ideas for a recipe the French always check what is in season at the local markets because the ingredients will have the best flavour. We have beautiful Yellow cling peaches in season in the Cape right now. You can tell their ripeness by their smell and feel gentle (not crisp) to the touch. This weekend I had to take along a desert for an outdoor lunch to celebrate the arrival of my sister from chilly England. 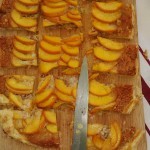 Therefore the best choice for ingredients was peaches, after discussions with Nicky we combined a traditional frangipane tart recipe with some Armagnac. This rustic style brandy from Bas Armagnac, south of Bordeaux, brings out an extra layer of flavour to the frangipane. It’s easy to make and to transport to another venue, which is always a point to keep in mind. I have had some messy experiences with lemon curd spreading all over me and my car. This delicious tart can be served hot or cold accompanied by ice cream or crème fraiche. I recommend pairing with a chilled glass of Lanson Ivory demi-sec champagne. This champagne is slightly less acidic than a brut champagne and brings out the flavour in the fruit. 3. Blend the almonds with a kitchen blender or place them between 2 layers of waxed paper and use a rolling pin to smash them into smaller pieces). The pieces should be quite small. Place in a large bowl. 12. Cut each peach in half (don’t peel), twist the two halves apart. 17. Sprinkle castor sugar lightly over all the peaches and pastry edge. This delicious tart can be served hot or cold accompanied by ice cream or crème fraiche. I recommend pairing with a chilled glass of Lanson demi-sec champagne. This champagne is slightly less acidic than a brut champagne and brings out the flavour in the fruit. Copyright French Market © 2006 - 2014. All Rights Reserved.